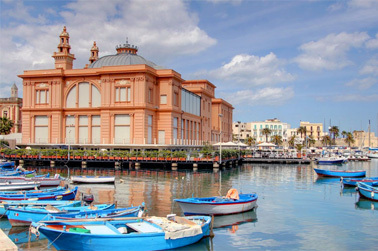 Bari offers different types of accommodation for the visitors from luxurious hotels to guest houses. The city is located on the Adriatic coast, so best hotels provide seafront view to their guests. Some of the hotels are very good for staying in the heart of Old Town. They are very convenient for exploring the city attractions and for shopping. 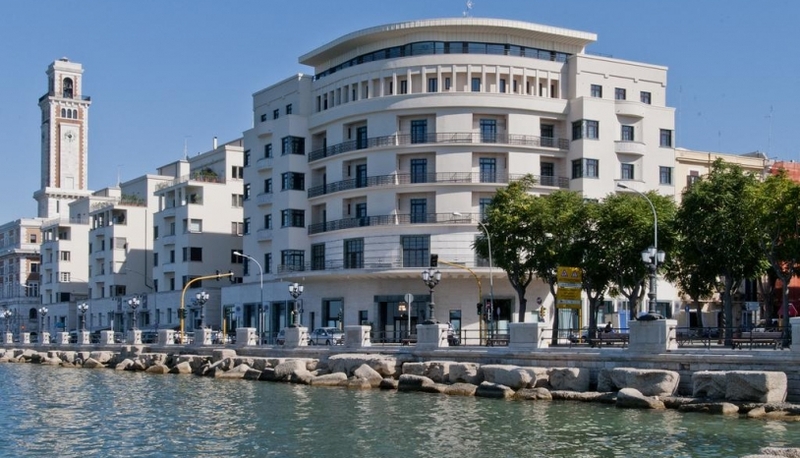 In this review we provide information about some hotels in Bari. This is one of the best hotels in Bari. This hotel has the highest scores from the guests for its amazing view, good location and high level of services. Its location is very convenient: not far from Central Railway station, 10 minutes walk from the beach and 20 minutes walking distance to the old town. This hotel is famous for its terrace with an amazing view to the sea and to the old town. In Grande Albergo Delle Nazioni guests can feel very pleasant atmosphere of Grand Old Hotel. In the morning plenty breakfast is served and in the evening it is time to taste delicious dishes in the high quality restaurant. Specious rooms with parquet floors, light-blue marine décor, and modern bathrooms make the stay comfortable and pleasant. Besides, there is a heated outdoor pool in the hotel. If you would like to feel the atmosphere of luxury in traditional old hotel you should choose Grande Albergo Delle Nazioni. This is one more beautiful hotel to stay in Bari. Located in the heart of the Old Town, Palace Hotel offers the atmosphere of luxury and tranquility. The interior is richly decorated with antique furniture and contemporary art. The restaurant is finely located on the roof of the building surrounded by flowers of the garden. It offers exquisite food with the best view to Citta Vecchia. Basilica of St. Nicolas is very close. It is so pleasant to have delicious dinner admiring the views. Good tasty breakfast with fresh coffee is served every morning. It is ideal place to stay in the heart of the Old Town. This is 4-star hotel with spa center. It is located close to the railway station and in just 15 minutes walking from the Old Town. It provides lovely specious comfortable rooms. Guests can try rich Italian and continental breakfast with fresh focaccia and mozzarella. The hotel provides plenty space for parking, nice pool and well equipped gym. The area with a nice garden is very pleasant. This elegant hotel with its nice park and swimming-pool reminds an Italian Villa. It is a lovely boutique hotel in the middle of Bari old town. It offers nice modern studios with all conveniences and fast Wi-Fi. This charming hotel occupies a recently renovated old building. The location is fantastic in the heart of historical center. The interior of studios creates the atmosphere of the Old Town. On the top there is a terrace with a fantastic view. An Italian breakfast is served each morning. This place is very comfortable and besides it is the best value for money.